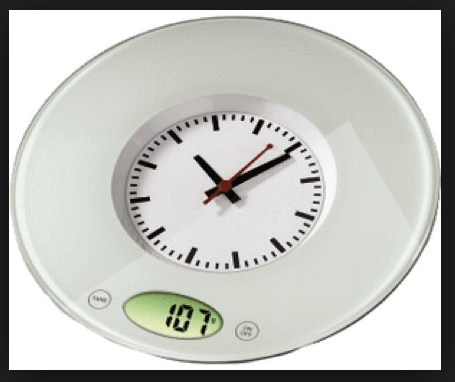 OMG, It’s a Clock and a Scale…It’s TIME! With teaching so much (excuse #1) I’ve been eating healthfully, but not AS awesome as I would like. I haven’t been eating after 8PM (which I love), but I’ve been on the go so much (excuse #2) I’m only cooking about 50% of my meals and adding breads in before 3PM…this is NOT what I want to do (just being a gluten glutton). The gluten in bread makes me feel “puffy” and gross. All of these aren’t making me feel EXTRA Fierce and that’s the plan, right? I’m doin’ it TODAY…no cheating, lots of sleeping and LOADS of healthy veggies. I weighed myself this AM and my goal over the next 5 weeks is to drop 8lbs. My mantra in class is #IcanIamIwill and I’m bringing that to THIS now! I haven’t had an official weight loss goal in a while. Getting on the scale made me feel good, strong and in control. There was a time where I felt defeated getting on the scale and now I’m in the game to WIN (me and Charlie Sheen)! The effect of these goals is dropping lbs, but REALLY the goal is to FEEL awesome! I feel GREAT right now, but I’m going for AMAZIBALLS, People! Okay, Fierce Ones, What’s your goal and what’s YOUR plan to get there? It’s time to get on it! Today is YOUR day. Let the fun begin and let me know what you’re up to by posting below! I can see you GETTING FIERCE(R) starting TODAY!! This entry was posted in FIERCE FUN, FIERCE HEALTH, FIERCE SOUL, FIERCE- ISH and tagged #weightlossnow, balance, committment, fitness, food, health, love, motivation, weightloss, workout by GETFIERCE TRAINING. Bookmark the permalink.